Frascati Shopping Centre was acquired by Burlington in 2015 on behalf of an international property investment fund managed by Invesco which is a major US financial institution. BREL are actively pursuing a project to extend and refurbish the existing centre. This project will deliver 24 additional retail units and increase the overall retail area from 98,800 sq ft to 164,220 sq ft. Initial planning permission was granted for the extension of scheme by DLRCC on the 31st October 2014, a number of subsequent applications have been granted and work on the new centre started in early 2017. The new shopping centre is due to open for Christmas 2018. 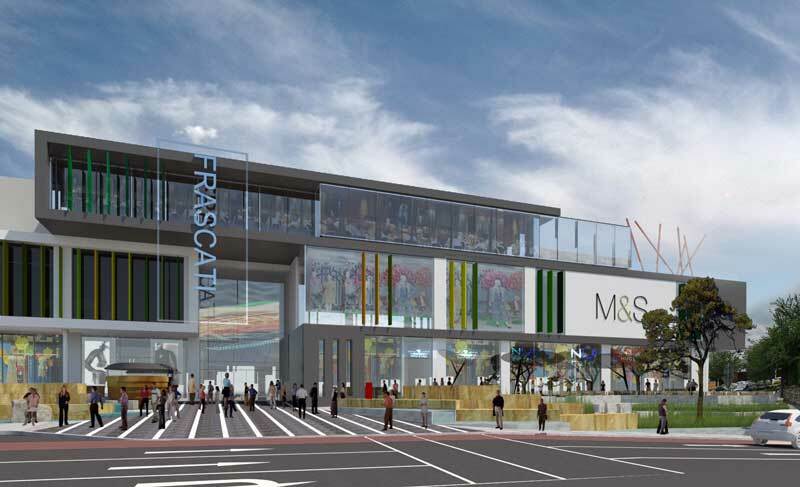 This exciting scheme is poised to rejuvenate the existing Frascati Shopping Centre by delivering contemporary retail units which will respond to modern retailer demands. A new road junction has been built on the Frascati Road which will incorporate a right turn into the centre when travelling from the city and a right turn onto the Frascati Road when exiting the centre. This will significantly improve the accessibility of the centre.